Can a Cavity Be Reversed? Hear What a Dentist in Westmont Has To Say! Wouldn’t it be amazing if we could reverse injuries or trauma to the body? Just imagine… broken bones wouldn’t require wearing a cast for 6 weeks, cuts would heal within minutes, and cavities could reverse themselves. Clearly, although it’s fun to think about, most injuries can’t be magically reversed and wind up requiring medical treatment. But you might be surprised to hear that – in some cases – cavities actually can be reversed. Learn more from a dentist in Westmont about how to catch cavities in their early stages and reverse them, before they require fillings! The outer layer is called enamel. It’s the hardest substance in your body – even harder than your bones! The second layer is called dentin, which is a bit softer than enamel. The third, innermost layer is called the pulp. It’s the softest layer and is where the nerve and blood supply of the tooth lies. Enamel and dentin are made of various minerals that make them hard and strong, including calcium, phosphorous, and sodium. 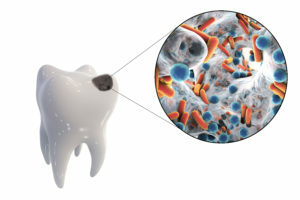 A cavity occurs when these minerals are lost, resulting in a “soft” or decayed area. This mineral loss largely occurs from the natural acids produced after eating meals, especially meals that are heavy in sugars or carbohydrates. These acids wear away at the enamel over time, just like acid rain wears away at stone. Thankfully, if this acid damage is caught early enough when it’s only damaged the outer enamel layer, it can still be reversed! How Can Cavities Be Reversed? Since cavities occur when the minerals in teeth are lost, the best way to reverse the process is to add mineral content back into the enamel. How can you do this? One of the most tried-and-true ways is using topical fluoride in toothpaste, mouthwash and professional treatments. Fluoride counteracts the effects of acids by strengthening the teeth and reverses small cavities that haven’t progressed past the enamel layer. Essentially, when someone eats or drinks something sugary in a short time period (10-30 minutes), the exposure to acid is short. But if they sip or graze throughout the day, it overwhelms the body’s natural defense (saliva) and quickly leads to cavities. Finally, in order to be proactive about small cavities, it’s crucial to schedule regular dental visits so that they can be found in the first place. If a dentist does find any cavities, they’ll recommend the best way to treat them – hopefully before they’re large enough that they need fillings! Dr. Kathy Lam is a general, cosmetic and restorative dentist in Westmont who firmly believes in the power of early intervention. She knows that patients can avoid extensive dental work when cavities are caught in their early stages, so she always encourages her patients to come in for regular checkups. If you have any questions, she can be contacted via her website or at (630) 789-1555. Comments Off on Can a Cavity Be Reversed? Hear What a Dentist in Westmont Has To Say!